"No bloody chicken drumsticks, please!" I must admit that the description of these sticky drumsticks sounds fingers-licking good... but there is no precise instructions on how to grill these drumsticks to avoid any "bloody" inside. All Curtis wrote is "transfer the drumsticks and marinade to baking sheet and broil, turning them occasionally and watching them closely for 25 minutes..." Is 25 minutes of grilling long enough to cook the chicken? What temperature should I use to broil these drumsticks? To keep my promise, I have to make sure that the insides of the drumsticks are thoroughly cooked without burning their outsides. To do that, I have covered the drumsticks with foil and cooked for 30 mins at lower temperature in the midst of grilling them. With these extra thoughts and efforts of grilling, I'm glad that our chicken drumsticks are thoroughly and also nicely cooked. - phew! This recipe is published in the book, Relaxed Cooking with Curtis Stone. For this recipe, Curtis wrote "The first time I made this, I served it to a group of kids and watched them become instantly mesmerized as they devoured their dinner. Okay, so I've learned to serve them with napkins. I guess I am still a big kids." .... Curtis, please don't serve these with napkins... Licking the sticky fingers is good! - LOL! 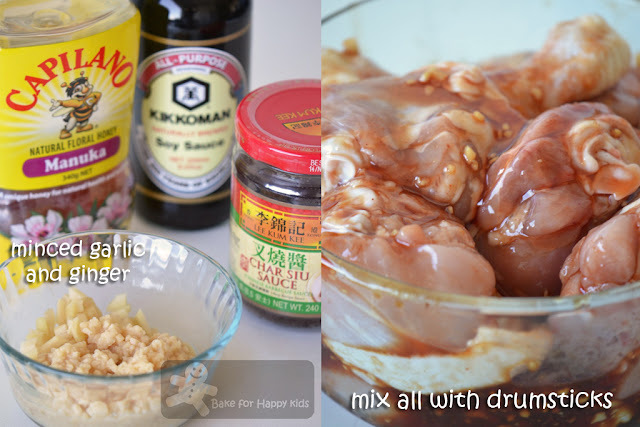 This Asian-style marinade uses fresh ginger! Mix the soy sauce, barbecue sauce, honey, garlic, and ginger in a resealable storage bag to blend. Add the chicken, seal the bag, and toss to coat with the sauce. Refrigerate for at least 1 hr but preferably overnight. Line a large rimmed baking sheet with heavy-duty foil. Transfer the drumsticks and marinade to the prepared baking sheet and broil, turning the drumsticks occasionally and watching them closely for 25 mins, or until the chicken is cooked through and the marinade has glazed it is cooked through and the marinade glazes the chicken. The grilling time of the drumsticks is highly depending on the sizes and number of the drumsticks and the 18 ones that I was using were really huge. I have marinated the 18 drumsticks with double amount of marinade overnight. The drumsticks were grilled at 200°C fan forced with top grill for the first 20 mins. Lower the oven temperature to 160°C fan forced and cover the drumsticks with foil.and continue to cook for 30 mins. Remove foil and increase the oven temperature back to 200°C fan forced with top grill. The drumsticks were grilled for another 5 mins at each sides for a nice browning finish. Glaze with extra warmed honey. 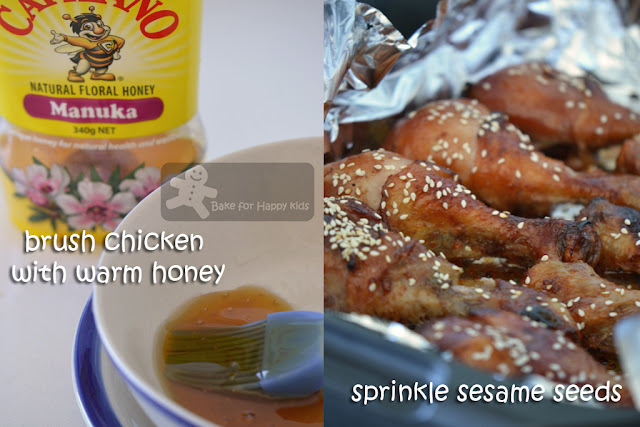 Sprinkle the sesame seeds over the chicken, and serve. Yes! Thumbs up and finger licking good too! That glaze looks so wonderful and flavorful!! Two thumbs up! It's thoughtful of you to put extra thoughts to not make bloody chicken. I love your idea of using aluminium foil. For me, I usually put my oven with fan-forced function as well as putting a tray in a tier above my baking tray of chicken. 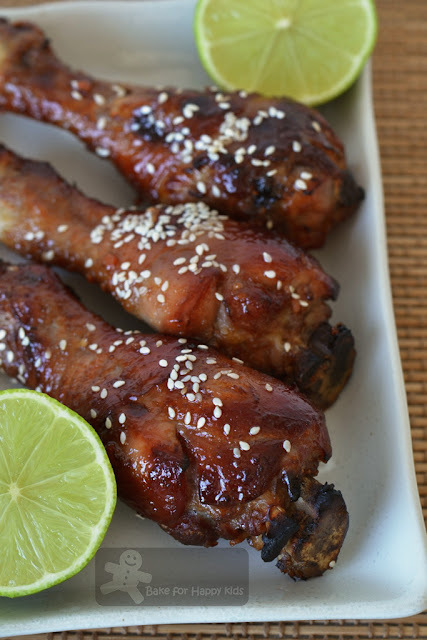 Absolutely love your sticky chicken drumsticks!! My tummy is rumbling now. Hi Zoe, this looks really good! 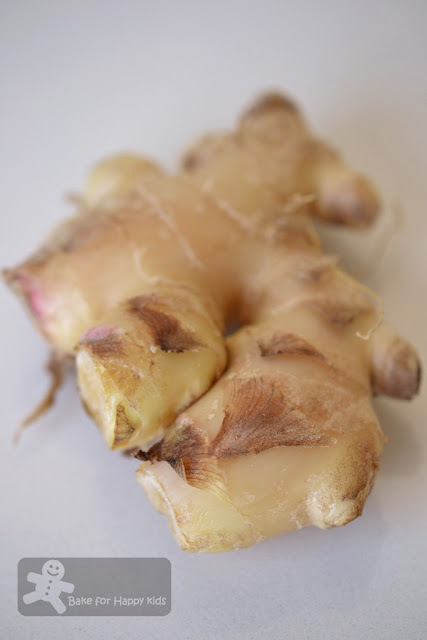 I love using ginger in meat, make the meat so tender and flavourful! I rarely make anything savoury with my oven so this is something I would love to try. This reminds me somwhat of Korean-style chicken with the glaze and sesame seeds. Really delicious looking! looks so yummy, sesame and char siew sauce taste good when combine together! Looks delicious and I know that my kids would thoroughly enjoy this. Will definitely try this one out one of these days! Zoe, I'm my kids will love these sticky chicken. Look so yummy! I have the same fear of uncooked chicken so your idea to bake before grilling is a good one. They look lovely. 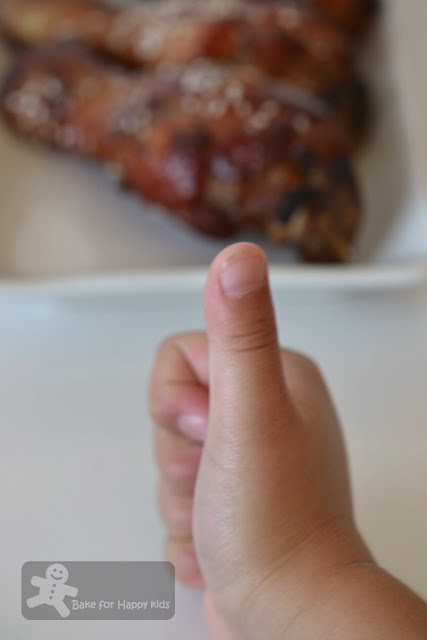 Zoe, these sticky chicken drumsticks look super delicious!!!! Lol, the first time i served my husband chicken wings, they were bloody too. he is always cautious whenever i serve him chicken wings thereafter! Hi Zoe! My personal experience is using 180C(fan forced) & I normally prick the chicken when marinating them & after finish grilling, you can even see the holes. I did it for all my grilled chicken maryland. Hmmm, now let me just appreciate these chicken drumsticks! Can imagine these are very flavorful! Great finger food. My family would love these. Nice and sweet but savory too. This is my first time visiting. Nice blog! Zoe, I love chicken drumsticks and my family also favors drumsticks over all the other pieces. I love how it turned out for you and such a great recipe from Curtis Stone. The sesame seeds add extra flavor and makes it look pretty! 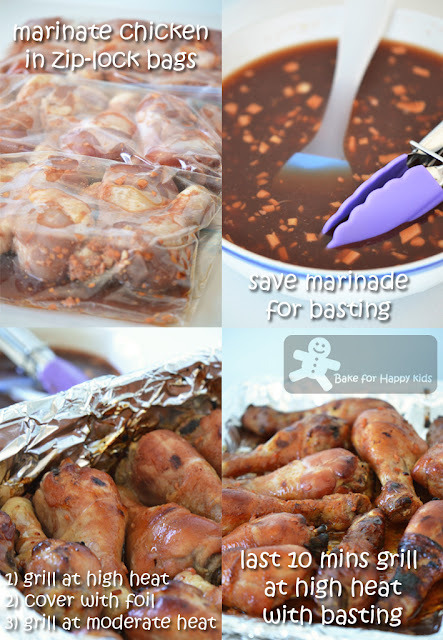 With that combination of marinade ingredients, it is guaranteed a winner! I noticed you use capilano manuka honey - i must get a bottle of that when i come to Oz. feel so "hungwee" just looking at it!!! Zoe, the drumstick is so delicious and love the colour. So delicious. Has to eat it with our fingers and not fork and spoon. I am salivating just looking at those photos. Bravo. Yum! These look so nice! Haven't been blogging much lately so haven't visited here but as usual your blog post never disappoint. Good job! Nice Nice! Can I use old ginger for the extra kick?! Hi Zoe, good way to cook chicken without the oil splatter. Nice drumsticks most children would love to have.